The Body Shop has announced that its latest Re-Wilding the World through its World Bio-Bridges Mission project will be located in Queensland, Australia. Home to the iconic symbol of Australian wildlife, the koala, more land is cleared in Queensland each year than the rest of Australia put together. The new Re-Wilding project will help protect the country's diminishing population of koalas who are under threat following decades of deforestation. 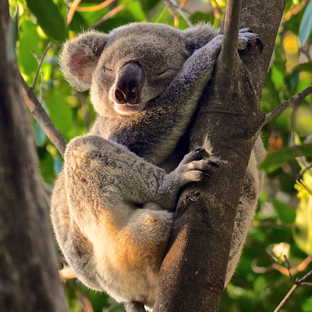 The Body Shop has partnered with Koala Crusaders and The Noosa Biosphere Community to stem the decline and to provide a safe and re-connected habitat for the koala population to flourish and re-populate. The project aims to restore 750 hectares of forests in the centre of Noosa, Queensland, an area severely affected by years of catastrophic levels of tree clearing and habitat fragmentation. In addition to Australia, The Body Shop has also announced a new Re-Wilding project in Kyrgyzstan. Working with Fauna and Flora International, The Body Shop’s project will support the restoration of 400 hectares of forest through community led programmes which will allow long-term regeneration of forests, as well educating the local community on sustainable living and farming methods. As part of its mission to Re-Wild the World through its World Bio-Bridges Mission, an initiative which connects areas of rich biodiversity and protects some of the world’s most endangered animals and plant species, £1 from every new limited edition Hemp and British Rose Hand Creams sold will be donated to the programme. Since the launch of the initiative in 2016, The Body Shop has helped to re-wild additional areas in eco-distress including Vietnam, India, Indonesia and Malaysia, protecting an impressive 41 million square metres of forest so far.